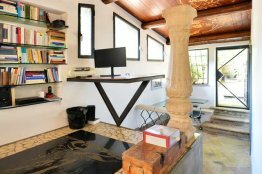 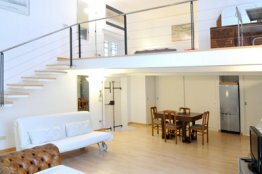 This charming air conditioned Trastevere modern loft apartment is situated in one of the most popular streets of the neighborhood: Vicolo de’ Cinque. 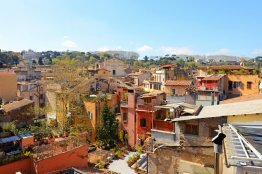 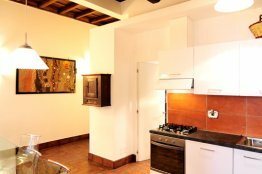 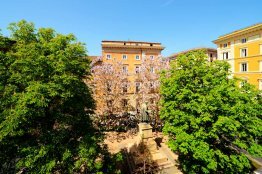 This Trastevere Cozy Studio Apartment is located in the characteristic neighborhood of Trastevere. 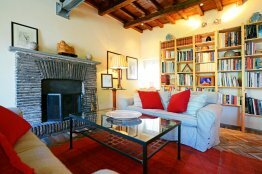 The apartment is only a few minutes walk from the heart of this enchanting quarter of Rome. 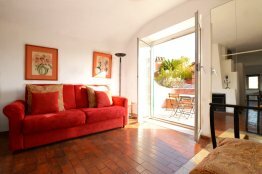 You will find the apartment on a quaint and quiet street. 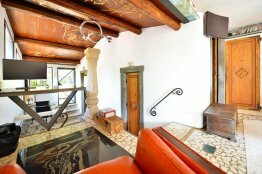 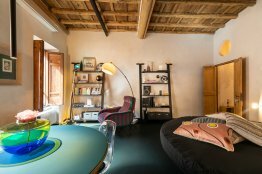 You will find this amazing loft in Casa dei Fabi, which dates back to the 15th Century. 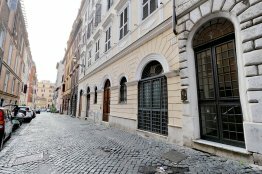 It is one of the nicest buildings of the historical center of Rome. 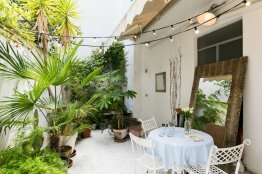 As you can see from the pictures, this marvelous building boasts antique columns, large patios and elegant marble stairs. 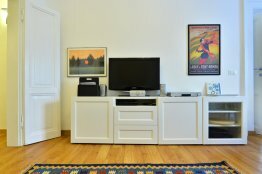 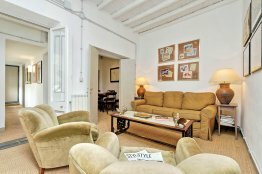 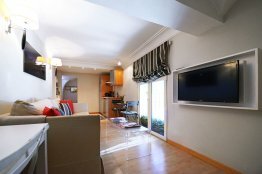 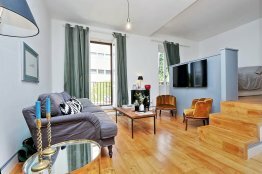 You will find this Trastevere contemporary stylish apartment on a quiet street in a characteristic neighborhood of Rome. 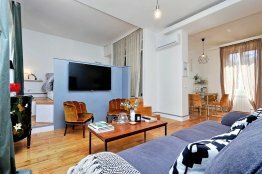 Natural light floods this apartment. 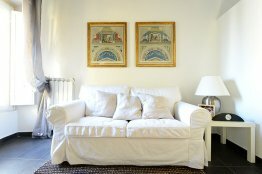 You will find this charming Rome apartment in the heart of one of the oldest neighbourhoods of Rome: Rione Trastevere. 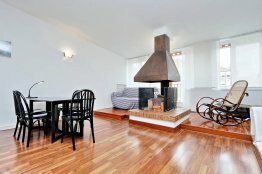 This luxury apartment features truly beautiful, original oily finish painting on the walls. 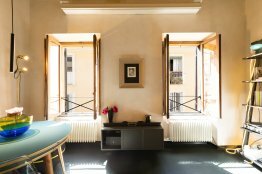 Located in Rione Monti, this Rome apartment sits on the 5th floor of a building without a lift. 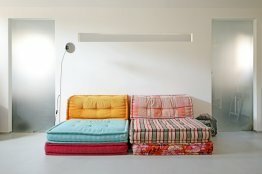 Its open spaces provide the sleeping area, which consists of a queen size bed, night tables, and lamps. 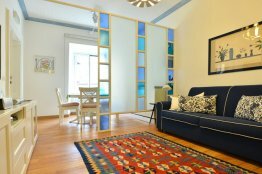 Wonderfully located in the area of Prati, this stylish one bedroom apartment is a sure bet if you are looking to explore Rome to its fullest. 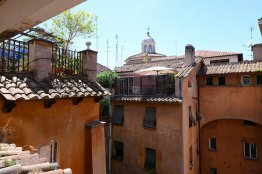 This Jewish Ghetto apartment for rent is perfect to accommodate a family visiting Rome. 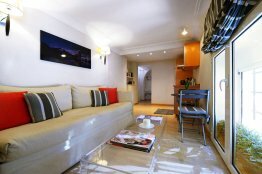 The living room, elegantly furnished, features blue velvet sofas, a coffee table, a 47″ flat screen TV. 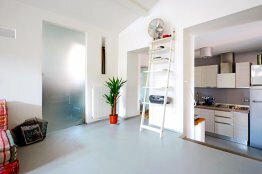 You can also enjoy a delicious meal around the modern table with “phantom” design chairs. 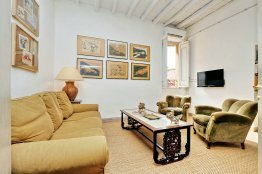 You will find this nice, new and well-kept apartment in the Roman Jewish ghetto. 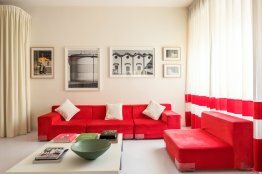 This stylish apartment will make your Roman holiday an unforgettable experience! 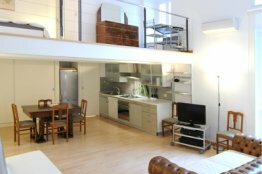 Ideal for couples or friends, this loft features stylish interiors and beautiful open terrace, perfect for dinners and drinks.